It would appear that summer is over. We are, after all, midway through September and Christmas is nearly here. Again. But it isn’t all doom and gloom. When it comes to dressing, I find autumn/winter a far more exciting and engaging season – better textures, better colours and better layering options. Sadly, it isn’t yet cold enough to break out the chunky roll neck, but it is definitely getting cooler and it’s time to pack away the shorts, bury the espadrilles and banish all thoughts of another sunny day on the beach. We’ve been covering the awkward transitional period in recent weeks; considering how to make the most of this strange period and highlighting a few of the key pieces that will play a major part in your wardrobe in the coming weeks. Today it’s the turn of outerwear… but not in the way that you might expect. Ask any sartorially-inclined man to reel off a list of essentials (if you believe in such a thing as ‘essentials’) and you can almost guarantee that a blazer (probably navy) will be near the top. Personally, I’m not so sure, but it is certainly undeniable that the blazer constitutes a significant part of many a man’s wardrobe. Blazers are, of course, very easy to wear: put on a shirt and just throw your blazer over the top. However, I don’t think it would be unfair to say that whilst this approach will create a smart and well put together ensemble, it’s perhaps a touch safe. As more and more men start caring about the way they look, making yourself stand out becomes harder and harder – but you don’t have to go all out ‘fashion week weird’ to avoid blending in; even the smallest changes can make a huge difference. When it comes to blazers, one of the easiest ways to subtly differentiate your look is to use it as outerwear. Rather than having it as a mid layer or sticking to classic combinations, some clever layering and a little bit of imagination can completely transform the aesthetic of the piece. So when it’s cold outside, but not so much that you would need a coat, your blazer can be the perfect alternative and would serve the purpose just as well as any other jacket. Before we start, it is important to identify the type of blazer we are concerned with today. Formal or suit blazers are not congruent with the aesthetic we are looking to achieve, plus they should be perfectly tailored to fit just a single layer (shirt) underneath. Trying to layer multiple pieces, including knitwear, under your formal jackets will simply ruin the clean lines and drape you have tried so hard to create. Instead, consider blazer styles that straddle the line between smart and casual. Think unstructured construction; textured jackets in tweed, canvas or cord; casual features such as patch pockets, contrast collars, heritage patches and piped detailing; on trend patterned styles in plaid or herringbone; and a slightly more relaxed cut that can fit a couple of layers underneath. Remember that this isn’t a traditional blazer that will be worn to work every day, you are buying it for the purpose of crafting a variety of smart-casual outfits for the colder months. On the surface this is a technique that would appear to only work as part of an editorial look; the kind of outfit that you can pull off on a photo shoot, when everything is perfectly managed and the model is standing completely still. This isn’t the case – you just need to adapt your clothing choices to fit the situation (and you). The best place to start is with a thinner denim jacket or thicker, more rigid denim shirt. As much as it might go against FashionBeans‘ usual mantra, cheaper is better here, simply because the material will be thinner. This will enable you to layer it under your blazer jacket, without it looking as though you have stuffed yourself into your clothes. The wash or colour is entirely up to you, but a mid to light wash will probably work the best in this scenario; they’re more relaxed and will provide a greater contrast when layered. Due to it being used as the under layer, it is imperative that you opt for a slim-fitting jacket or shirt in order to maintain a streamline silhouette. Unstructured, casual blazers will suit this look best, so ensure you have little to no padding through the shoulders – these styles will allow you more room to manoeuvre and will also drape better over the shoulders of the jacket. Experiment with blazer colours and pop the collar on the jacket or shirt to create a defined separation between the two. If you have working buttons on your blazer, try leaving them undone and manipulating the sleeves to add further detailing. Knitted blazers are the perfect autumnal layering piece; they fill the void between standard knitwear and coats and are a fantastic addition to any wardrobe for the next couple of months. Combine with other knits, sweatshirts, shirts, tees, polos – pretty much anything you can think of. Make sure you build up your outfit gradually and consider how both the colours AND textures combine within the overall aesthetic. Blazers like this add a superb tactile element to any ensemble, which is something I believe many people still don’t appreciate. Different textures and materials make a huge difference to an outfit and can take even the most mundane looks to the next level. If you are looking for inspiration on how to combine textures, try Matt Allinson’s excellent article series on layering. Play on the tactile element within your outfit by accessorising with scarves and leather gloves when the wind starts to get bitter, using your blazer to stave off that final chill. When it’s wet outside, you can easily throw a bold fisherman’s jacket or a classic single-breasted mac over the top to protect yourself from the elements. Don’t be afraid to dress things up either – a white Oxford shirt, textured wool tie, staple piece of knitwear (v-neck or crew), your knitted jacket, some dark jeans and a pair of chunky soled boots provides the foundation for one smashing autumn look. Heavyweight blazers are those that are produced in thicker materials and fabrics such as corduroy, tweed, heavier woollen weaves, herringbone, houndstooth etc. Built specifically for the colder autumn/winter season, this type of blazer has the potential to become your go-to jacket well into winter. The great thing about utilising a textured, heavyweight blazer such as this is that it is infinitely more engaging and versatile than a traditional overcoat, especially when crafting smart-casual outfits that retain a sense of practicality. 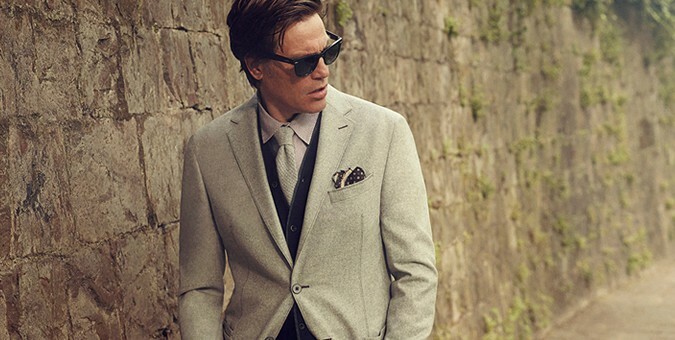 We are all very familiar with the rules of buttoning blazers, but rules are meant to be broken and in the casual context, you can do pretty much whatever you like – leaving your blazer undone will allow you to show off your excellent layering skills, whilst adding many more interesting dimensions to your look. In terms of a go-to outfit, consider a Henley tee, shirt, jumper/cardigan and blazer combination – it works for the majority of scenarios and occasions, and you can strip off, unbutton and add layers as required. For a slightly smarter approach that plays with the concept of silhouette, try layering a roll neck under a denim jacket and then throw your blazer on top (similar to the denim layering technique described earlier). Leave both jackets unbuttoned when it gets warm and then do up each as required. In terms of final finishing touches, again consider rolling up the sleeves of your blazer to show off whatever you’re wearing underneath. Also consider popping the collar on both your jacket and shirt and playing around with how many buttons are done up within each layer (whether on your Henley, denim jacket or cardigan). All these techniques combine to add layers and texture to the look, stopping it becoming too formal by breaking up the traditional shape of the blazer and removing its rigid, structured edge. So there we have a quick round-up of some of the ways you can transform your blazer into a makeshift jacket this autumn. Most of it is common sense, and perhaps a touch of thinking outside the box, but it shows you just how versatile your blazer can be, even with only the smallest of changes. The transitional period is an awkward time, but that just means it’s a great time to experiment and try new things. Who knows, you might even surprise yourself and develop a new signature look.